We weren’t able to have our Friday Night Fire cookout last week, so I was stumped about what to do with the hamburger. Nothing sounded good. Amounts will depend on you. Use more or less of the vegetables to your taste. Use more or less hamburger, depending on how many people your serving. I used two pounds of hamburger divided into two patties. I topped them with diced green peppers and diced onion. 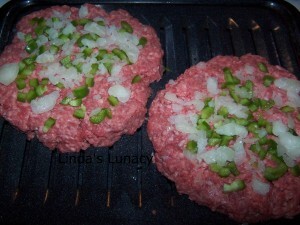 You could also cook the patties without the onions and the green peppers, and add them raw later. I didn’t any any seasonings to the hamburger, but you certainly could. I baked these patties *350 for about 30 minutes. Time will depend on thickness of patties, and how well done you want them. 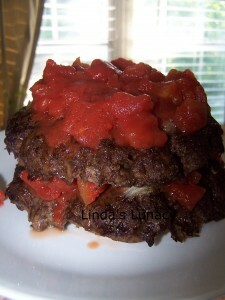 I then put diced tomatoes on one layer, topped with the second pattie and more tomatoes. If your using raw onions and green peppers, layer them with the tomatoes. I sliced it up like a pie and served with baked potatoes and green beans. 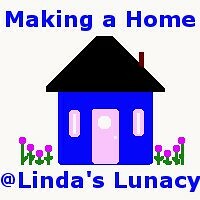 My family loved it! They were disappointed that I didn’t make more. 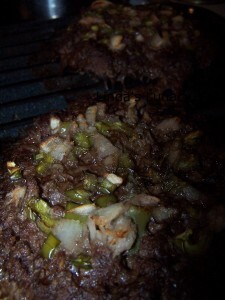 Shape hamburger into two patties, seasoning as desired. Top with onions and green peppers (or add them raw after cooking). Bake at *350 for 30 minutes or until desired doneness. 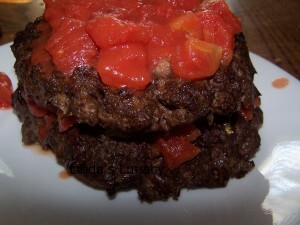 Top one pattie with tomatoes, If using raw onions and green peppers layer them now. 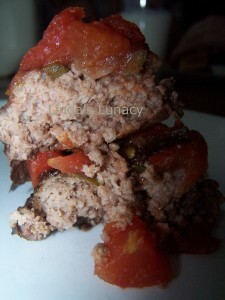 Then layer other pattie and more tomatoes (and onions ang green peppers). To serve, slice like a pie.